Happy 50th Anniversary to Gen Con! Team Ronin is super excited about Gen Con this year, especially with the success of our updated Freebooter GM Program. We decided to focus on our one big event, as we’re kinda small to support events all over the country and beyond. Make with the clicking to read about the program here. Many folks think Green Ronin is a huge company, but we’re actually very small. The upside to this is that we can work closely with our GMs to grow this program; it wouldn’t be as successful without their spectacular feedback. 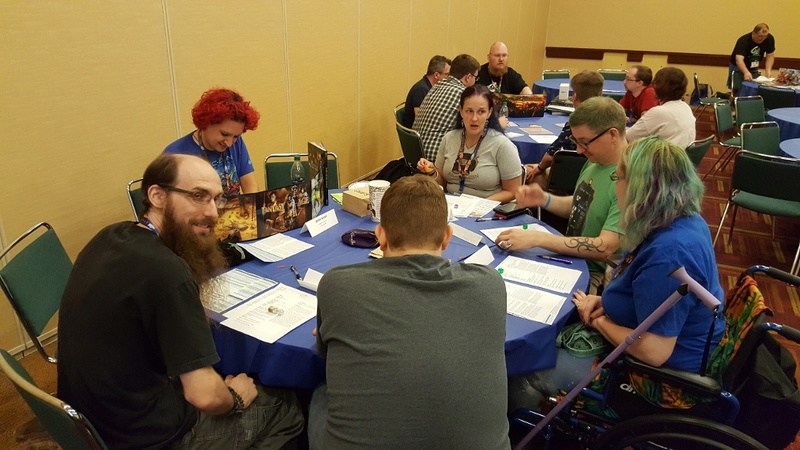 And since it was our first big push, with setting up GM Badges and hotel reimbursement, it helped us make the 2017 Gen Con program even better. Last year, we fielded 24 GMs running over 90 games. Some folks ran one or two games, and some ran more. Some folks ran 2-hour games, and some ran 6-hour games. Really, it was great to have so many folks concentrating on Green Ronin games. We were even in our own room in the Convention Center itself, which was WONDERFUL. For the folks who signed up early, who communicated well with us about their needs and desires, it was super easy to accommodate folks, like subbing out GMs when we had scheduling issues. For folks to get hotel reimbursements, it was super easy! You just had to email me your receipt and we sent you the reimbursement! Almost everyone followed directions well so we were able to take care of just about everyone by the time Gen Con was all finished! We had a lot of folks GMing for us who had never been to Gen Con before, or GM’d at a convention ever, which meant so much to us. And our experienced Veteran GMs were on hand to help out the new folks. The Freebooters are a small team, but a wonderful team! Heck, a bunch of new folks to our program even got together and split a room together! They held each other together while I was off doing Geek & Sundry and Gen Con Industry Insider stuff! Many GMs kept things simple, and many of them printed out great color sheets, special hand outs, and whatnot. Some GMs used our published Quick Start adventures, some used their own home brew. Some used adventures which we haven’t yet published, to be the first to run said adventures. Why am I tell you all this? Because we want you to run our games! Everyone is welcome, no matter your experience, or lack thereof. If you have GM’d a home game, you can GM for us! You can run what you want, when you want. And if you want to, we’ll arrange a GM badge for you, so you can get reimbursed by the Gen Con system, and we’ll reimburse you for part of your hotel. For 12-hours of games submitted, we’ll arrange the GM badge. For 16+ hours of games scheduled, we will reimburse your hotel based on ¼ of a regular rate. As an example, if a room is $200 per night we’ll pick up your part, so $50 per night! AND! Based on feedback from the 2016 GM Team, we’ll have ribbons and dice for you to give your players, plus a variety of other hand outs. And maybe something cool for YOU, too! We’re still hammering out those details. If you’re interested in signing up, click here to fill out this quick contact form. Early submissions have started this week, and will run until Feb 19th. Regular Event submissions are due by March 26th, so we want to get your games in the system as soon as possible. I can help! Ronin Roundtable: New Year’s Message 2017 Ronin Roundtable: Enter the Modern AGE!